travel | Barranquilla or Bust! As an amateur runner who has been jogging for many years, I’ve had the pleasure (usually!) of participating in a LOT of road races. So I was really happy when the awesome folks at Catalyst Weekly—an amazing event guide and website for Medellín—invited me to write a post on road races in the City of Eternal Spring. If you live in Medellín or are willing to travel to run (it’s a thing! ), definitely check out this list. Registration dates are coming up fast! For more running-related posts from me, click on “Browse by subject” in the column to the right, and navigate down to “Running”. If I had to choose one old one for you to read, it’d be this one—hopefully you’ll get a laugh out of my pain. 😉 Until next time…. This is a screenshot of the Catalyst Weekly website; click here to go straight to it! We humans consistently underestimate how much we’ll change in the next 10 years, according to a 2013 study. If we envision the world around us a decade from now, I think we’re likely to underestimate the changes there, too – with respect not only to technology, but also to the people around us. As a foreigner living abroad, I sometimes feel like I’m a slow-moving planet orbiting a stationary sun while other planets whizz by. Medellín is popular with digital nomads, people attending Spanish immersion courses, adults on sabbatical, etc., which means many foreigners are here for a few months and then gone. Meanwhile, the city in general is known for families and social circles dating back decades, cemented by the mountains’ isolating geography and the city’s enduring appeal. With 5.5 years in my pocket, I find myself in the in-between. It’s not a bad feeling, just somehow different. The feeling has been more intense lately because a round of foreigner-friends all left in succession. These friends were made over brief periods of time, but nonetheless had significant impacts. Upon leaving, some of them generously gave me miscellaneous items – from clothes to plants to makeup remover – that they did not want or weren’t able to take back. So now, I write with Andrew’s pens (a serious upgrade from mine! ), wash my hair with Megan’s shampoo, cook with Shruti’s spices, and water Andrea’s weird but beautiful little fruit tree. This jetsam is a daily reminder of how each person enriched my life. The growing web of contacts I have all over the world is my consolation for the immediate vacancies. If I don’t underestimate my own rate of change, I’ll probably decorate next Christmas with garland left to me by a friend. For now, I accept my place in the middle – still a newcomer to my local friends (who never quite trust that I won’t jump ship), a long-term expat to my foreigner ones, and a sometime-connector between the two. It’s a weird place to be, but it’s home. 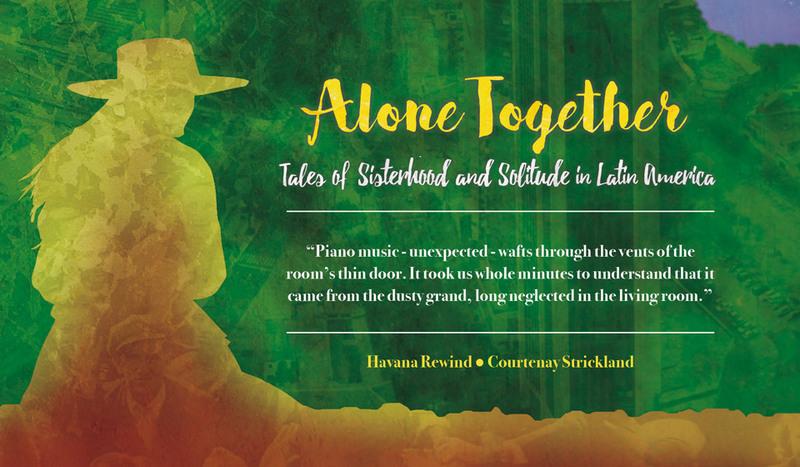 I am thrilled to have a poem in the about-to-be-released anthology, Alone Together: Tales of Sisterhood and Solitude in Latin America, which tells the real-life stories of multiple women’s solo travel. The book is a rush of emotions – joy, fear, sadness, love, and more. You can read an interview with me – about why I wrote what I wrote – on the Women Travel Latin America website. I can’t wait to read all the Alone Together stories and hope you’ll join me. TODAY, 20 November 2017, is the last day to purchase your Kindle version at the special pre-order price. Tomorrow is the official release and the price will go up. If you purchase today, you get the discount and your book will be delivered tomorrow. I share this with you not because I’ll make money from the book sales – I won’t – but because I know we have a shared spirit of adventure and because I never cease to be grateful for your support of my writing. Thank you! So… why did you move to Colombia? When preparing to move to another country, no amount of info is too much! In the months before relocating to Colombia, I turned to websites, online forums, and blogs for an idea of what to expect. So when ExpatFocus.com contacted me for an interview, I said yes. The interview – read it here – gave me an opportunity to pay it forward to those whose shared experiences helped me. 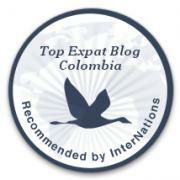 ExpatFocus.com also offers a lot of other destination-specific info – this Colombia landing page is an example. 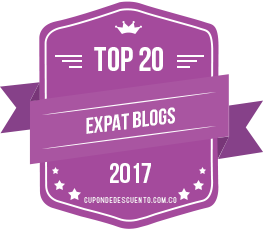 Thanks, ExpatFocus! Author’s Note: I’m just now publishing some old essays. I wrote this post (various versions) between July 2015 and March 2016. It should be associated with that time period. The pic is also a throwback. I’m now approaching five years in Colombia. This is a blog post I’ve started writing three times – a post about what it means to be “all in”, living as a foreigner in Colombia with no plans to leave. I first began the post about a week before the three-year anniversary of my move to Colombia. For many foreigners I’ve talked to here, three years is often considered the dividing line between those who are in Colombia for awhile versus those who are in it for the long haul. I thought it would be fun to mark the anniversary with a cheeky and hopefully insightful list of what being “all in” means – investing in furniture, buying a car, struggling through the process of getting a kid into private school here, and more. Together with my husband, I had done all those things. And then, on July 23, 2015, the very date of my three-year anniversary here, my marriage – which had endured for years despite not being the most stable – disintegrated. In the months that followed, I realized I had no idea what it meant to be “all in” in Colombia. The things I thought were markers of my assimilation meant nothing. It was no longer symbolic to me (how could it ever have been?) that I had ceased reverting to English when startled, that I had stopped pining for items from the US, that I no longer “translated” prices in my head. Even my apartment, which had begun to develop the layers that come from living or planning to live in a place for a long time, seemed like a shell – empty of the stability I had thought it represented. I now faced the daunting task of building a life in Colombia without a marital-style partnership and without relying on my husband’s cédula and other accouterments of citizenship. I needed to see if I could be single here, and single with a kid. I had to find out whether I could grow my business to a level that would allow me to save for a different future. I had to change everything. My silly list of what “all in” means deserves the shredder. I wish I could tell you that my current situation is what “all in” looks like – it would be a great comfort to know that the gaming table of life has a limit – but it doesn’t. We calculate our risks (and our risk tolerance) as best we can, make our bets, and win some and lose some. As for my writing, I have – temporarily, I hope – lost my voice, that elusive thing that is a writer’s stock-in-trade. With key pieces of my identity stripped away, my admonitions about leaps of faith – made in the belief that I had successfully made one – ring hollow. I’ve simply gone mute, the same as my one-year-old did for nearly six months when we first moved here. I find myself over open air, a child again at middle age, humbled by all I still have to learn, grateful for what may be the faint outline of solid ground on the other side.